More than 790,000 tonnes of food waste was generated in Singapore last year – almost the equivalent of throwing away two bowls of rice every day. There are no official figures on the breakdown of food waste in Singapore, and also how throwing away blemished or oddly-shaped food may contribute to the problem. But studies have shown that globally, 46 per cent of fruits and vegetables never make it from farm to fork. Vegetable peels, fruit waste and coffee grounds – all this organic waste does not simply go down the garbage chute at the Dover campus of the United World College of South East Asia (UWCSEA). Instead, these are given a second life as compost for the school’s gardens. In 2012, UWCSEA started a composting project in a bid to reduce food wastage. Getting the project underway was not easy – it involved a few high school students setting up a composting site within the school and collecting pre-cooked waste such as vegetable peels and fruit scraps from the canteen daily. Sometimes it’s lamb stew on the menu, other times it’s roast duck. For the past few months, Marina Bay Sands (MBS) has been donating excess food prepared for banquets to the less fortunate. On each occasion, an average of 50 to 80 trays of unserved, blast-frozen cooked dishes are delivered for same-day consumption. Under the watchful eye of Executive Chef Christopher Christie, kitchen staff check the food is at -5°C to -10°C before packing them into thermal boxes. Staff from The Food Bank Singapore stand ready to load them into a van for delivery. A two-year on-site food waste recycling pilot at two hawker centres, Ang Mo Kio Blk 628 Market and Tiong Bahru Market, was launched on Thursday (Jan 21). The National Environment Agency (NEA) estimated that each market generates two to three tonnes of food waste daily, with the majority from stalls in the wet market and table cleaning operations. If the pilot is successful, food waste recycling could reduce the total waste generated from both hawker centres by up to 80 per cent, the agency said. For instance, the machine at Ang Mo Kio Blk 628 Market, operated by Eco-Wiz, is able to convert one tonne of food waste into water within 24 hours. Customised microbes would break down food waste to convert it into water, and the water is then used for cleaning the bin centre. In calling food waste one of the biggest streams of waste here, Minister for the Environment and Water Resources Masagos Zulkifli said all stakeholders have a role to play in managing this. Some practices such as the culture of excess at banquets must change, “without totally changing the way we live as a community in Singapore”, he told reporters after the SGfuture dialogue “Moving Towards a Zero Waste Nation: Food Waste” led by his ministry today (Jan 10). 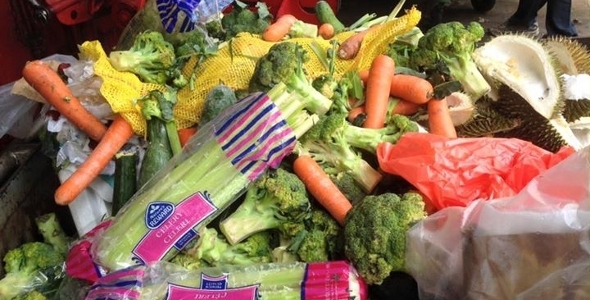 Reducing food waste is a way for households to save money, and Singaporeans should not take the amount of food available here for granted, he added. There is a need to rethink how to reduce, reuse and recycle food waste amid an increase over the years, said Minister for Environment and Water Resources Masagos Zulkifli on Sunday (Jan 10). In 2014, Singapore generated around 790,000 tonnes of food waste, equivalent to two bowls of food per person each day. Only 13 per cent of that amount was recycled. Over the past 10 years, the amount of food waste Singapore generates has increased by about 48 per cent, and the number is set to increase as the country continues to grow in terms of population and affluence. During the festive season, food waste is expected to go up by about 10 to 20 per cent, according to the non-governmental organisation Zero Waste. Some organisations have been looking tackle the problem. The increased waste comes from preparing more food during the festive season. The National Environment Agency (NEA) is launching a campaign next week to get people to cut food waste. This comes on the back of a study by NEA and the Agri-Food and Veterinary Authority of Singapore (AVA) which showed that many people in Singapore are not comfortable with wasting food. However, the study also found that the biggest reason Singaporeans choose to cut down food waste is not to save the environment, but the pocket. In 2014, consumers threw away 687,200 tonnes of food. According to the study, eight in 10 respondents felt bothered about throwing away uneaten food, while 90 per cent of them felt that it was a waste of money. Concern for the environment “came a close second”, said NEA and AVA. This article is contributed by Jean Chua. Here are the staggering statistics: As much as one-third of food produced globally for our dining tables is lost or wasted, according to the World Bank. Developing countries lose an average of 120 to 220 kilogrammes of food per person per year, which means that even those in regions ridden with malnutrition, such as South Asia and Sub-Saharan Africa, lose as many as 400 to 500 kilocalories per person, every day.